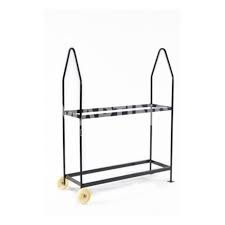 This display unit mounted on two fixed wheels can hold 10-14 tires with rims. Handling requires a dolly designed specifically for wheel-mounted tire display units. It is 60" long and ideally suited for heavier loads and uneven ground.